The Ear Reddening Move is a famous move played by a young Honinbo Shusaku against Gennan Inseki. Observers present thought Gennan would win, but a doctor felt otherwise because Gennan's ears had flushed red upon seeing Shusaku's famous move, an indication that he was upset. In would seem natural to hold an object with the shape and size of a Go stone between thumb and index finger, but this is not the traditional way to hold and play a Go stone. Not only does this look very elegant, it is also the easiest way to carefully place a stone in between a bunch of others once the board gets crowded. Hans Pietsch (Sep 27, 1968 – Jan 16, 2003) was a German 6-dan professional Go player with the Nihon Ki-in, one of the few Western go professionals. Pietsch moved to Japan in 1990 to become insei and a disciple of Kobayashi Satoru. In 1997, he reached 1-dan professional with the Nihon Ki-in. In the same year, he managed to beat Yoda Norimoto by half a point in the first round of the 1st LG Cup. By 2000, he had been promoted to 4-dan. Pietsch was shot and killed in an armed robbery on January 16th, 2003, while on a promotional tour for the Nihon Ki-in in Guatemala. He was posthumously promoted to 6-dan by the Nihon Ki-in on January 21st, 2003 for his great contributions to the worldwide promotion of Go, and was also awarded the 36th Kido International Award. EuroGoTV ( website) is a project started in 2007 to provide live broadcasts of top games played in Europe. The broadcast usually consists of a live video stream showing the players and the board, combined with a live recording of the game on a go server, usually KGS. The driving force behind EuroGoTV is Harry Weerheijm from the Netherlands, who provides equipment and the special EuroGoTV accounts for recording. Look for EuroGoTV at the top of the active games list, or check their website at http://www.eurogotv.com/ for upcoming broadcast. Nuclear Tesuji, also know as the nuclear tesuji, has a long and rich history and has many applications. Read all about the proper application of this powerful tesuji here, including proper technique for applying the tesuji, as well as the possible responses. This seemingly contradictory statement is inspired by the present boom in Korean professional Go. The competition between the Yeongusaeng aspiring to become professional players is so fierce that, by the time they effectively turn professional, they are already strong enough to compete with the strongest professionals. Semedori is a situation where you gain points by making sure that the opponent will be forced to capture a group of stones at some point in the future. Sometimes, this is the result of middle game fighting, at other times it is an endgame technique, where you add a cut or remove eyes so that some part of an opponent's group is in long term danger. In the example to the left, makes sure that black cannot make an eye. 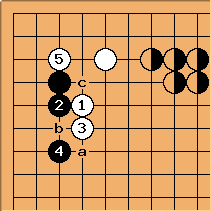 That means that Black will, at some point in the future, have to capture the marked white stones, otherwise White can create seki. Note that there is no urgency to make the plays, as white cannot play b without making an approach move at a. When White plays a, Black will have to play one of the circled points to avoid seki. Had black played at , he would have created an eye, and the two circled points would have been his territory. These two points are the additional gain of the semedori here for White. 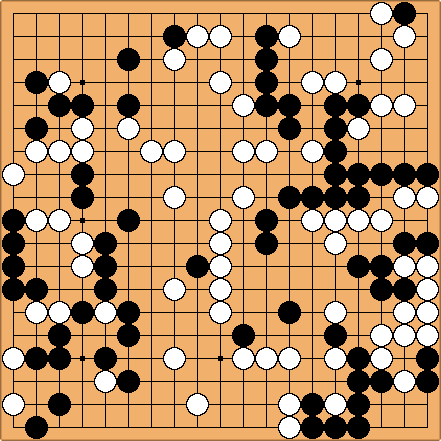 Given the simple rules and simple equipment of Go, it is very easy to think up variations on the rules, or other things to do with the equipment. This page gives an extensive listing of the ideas people have come up with. This includes regional variants such as Sunjang Baduk, historic variants such as Ancient chinese rules, variants with more colors and a myriad of other ideas. 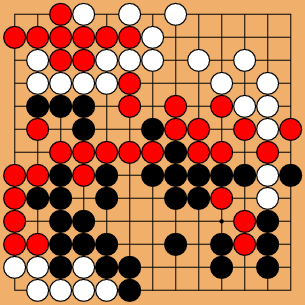 In a match between Chitoku and Genjo in April of 1812, at the start of the middle game, Chitoku made a move that was almost equivalent to filling a dame. 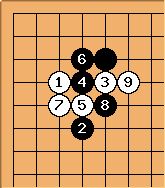 Go Seigen later described it as dame myoshu. 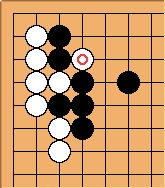 See the move and the reason why Chitoku played it. Many amateur players fail to consider the option of reducing a territorial framework, rather than invading it. In many situations, however, the reduction can be just as good as the invasion, but with considerable less risk. A mistake during an invasion may get your invasion group killed, which will generally force you to resign. A mistake during a reduction is much more likely to simply result in a small loss, from which you might still recover. A game-deciding ko (also known as tenka ko from Japanese) is a ko which is so big that a player must ignore any and all ko threats, and resolve the ko immediately, because losing the ko would lose the game. Sometimes it is possible to start and lose such a ko purely in order to gain profit from a very large ko threat. In those cases it may be an example of losing a ko to win the game. Enjoy this cross over fan-fiction written by SL user Hand of Hair, which combines elements of go playing and history with elements from the Doctor Who television series. An interesting exercise in thinking ahead in the fuseki. The solution comes from professional commentary, with additional supporting diagrams by our own librarian Dieter. A running fight describes a situation where both players have adjacent weak groups. If neither group has room to make a base, they will both have to run into the center. This will result in a running fight, where both players attempt to get the upper hand. 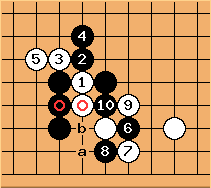 Most go players in the West are familiar only with Japanese counting (see an example), as used with the common territory scoring (territory + prisoners) rules. In China, as well as some other countries where area scoring (territory + stones) is used, the most common way to determine the score is Chinese counting (see an example). To those unfamiliar with it, this method may be quite bewildering at first, as stones are freely added to the board or taken off it. With a bit of practice, however, this method can be as easy as the Japanese one. Mutual damage is an important concept in the endgame. Many weaker players have a tendency to follow around their stronger opponent, responding blindly to moves that seem sente. It is better, instead, to look for moves that are your own sente against the opponent. If both player then follow up on their own moves, they will both get to damage their opponent's territory, hence the term mutual damage. Jabberwocks are side positions in which the whole board strategy aims toward large moyo building, or complex fighting. They were so named by Charles Matthews after a fictional monster from the works of Lewis Carrol. 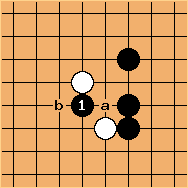 In the example position, was an old favorite of Ishida Yoshio, Black can aim at getting a. If White then plays the usual invasion at b, Black can press at c for a large scale moyo at the top, or play d to enter the Taisha joseki with its many fighting variations. This idea is explored further at the Carrollian developments page. If white prevents black from playing a by playing there himself, then black can choose to play at e, again leading to potential complicated fighting. 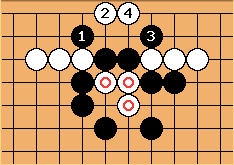 The sequence up to is known as the Taisha joseki, which is started by black with the taisha (great slant) move . 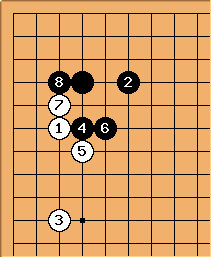 The taisha joseki is famous for its frightening amount of complicated variations. So famous, in fact, that the subject of avoiding those variations is worth a page in itself. Here, we will analyse several alternatives for , and also look at an alternative for , all of which avoid complications and reach a peaceful result. Such results are often slightly suboptimal for White, depending on the surroundings, but the disadvantages are often minor and quite acceptable to avoid a hard fight, especially at amateur level. The Hitachi Go Problems is a weekly series of life and death problems by Minoru Harada, a Japanese amateur 8 dan. Each week, two new problems will be posted, one "elementary" and one "intermediate", and the solutions to the previous week's problems will be revealed. Note that his problems are generally challenging and tricky, his typical "elementary" problems far exceed the difficulty of the beginner exercises here. Many people consider this one of the best problem collections on the web. Nerai is a word found often in Japanese go writing -- so often that it is clear that it is an important concept in the Japanese understanding of the game. It may belong to a select group of a half-dozen or less key strategic concepts. Iyama Yuta (井山 裕太 Iyama Yūta, born May 24, 1989) is the first Japanese pro who was born in the Heisei era. Iyama was a child prodigy, one of the youngest persons to become a professional player in Japan. He holds many "youngest to" records. Most notably, he was the youngest winner of the Meijin title in 2009. Currently he is holding both Meijin and Judan titles. His latest achievement is winning the invitational Bosai Cup against Yi Se-tol and Gu Li. The World Amateur Go Championship is a yearly event to determine the best amateur player in the world. Every country that is a member of the International Go Federation is eligible to send one representative. Theoretically, that would currently allow for 70 participants, but the maximum number of participants in previous events was 68, as some countries lack the funds to send a representative. The event is usually won by an amateur from one of the "big three" go playing nations: China, Japan and Korea. The only exception, if you can call it that, is the victory by the Hong Kong representative in 1986. The best performance by a representative outside East-Asia is a tie for first place in 1991 by Ronald Schlemper of the Netherlands, who was then awarded third place based on SOS. 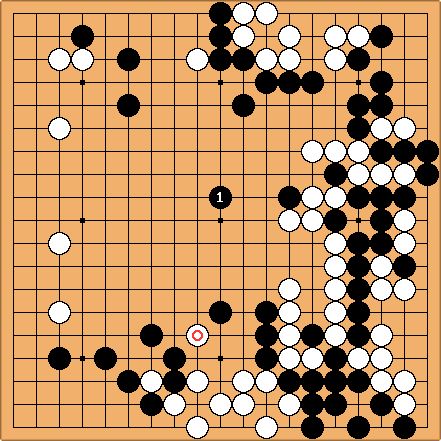 Go is a learning experience for most Go players, a learning process that can last a whole life time without coming to an end. In this page Tamsin condensed her insights into the process of learning into five short advices, which you too may find helpful. Some years ago still a child prodigy nicknamed "the next Yi Chang-ho", Park Jung-hwan has now, at the age of 18, grown up to a major force in the Korean Baduk circuit winning several titles in the past years. Among his recent achievements are winning last year's KBS cup, the pair go championship of the Asian games in 2010, which made him the youngest Korean 9 dan and reaching the semi finals of the 3rd BC Card cup, where he lost to the later tournament winner. He is one of the players we will undoubtedly hear about more in the future, so if you don't do it yet, you may want to start following his steps from now onwards. Go Game Guru is a new go website, run by David Ormerod (5d) in cooperation with An Younggil (8p). It features articles on a variety of topics, news on current events, and high level game commentary on recent top professional games, provided by An Younggil. Go Game Guru has very quickly become one of the most active and up to date go sites on the internet, and is definitely worth a regular visit. In the example shown, moves 1-3 are quite normal. Moves 4 and 6 needlessly strengthen white, while gaining little for black, who could have taken the corner immediately with a move at 8. The end position is equal to the 4-4 point low approach, tsukenobi, push into corner joseki, which is popular with beginners. Professionals only use these moves in special circumstances, where 4 and 6 have value. The European Go Database (EGD) collects the results of tournaments throughout Europe and used them to update the EGF Rating List, using the EGF Rating System. On the site, you can find the result of (almost) every serious tournament played in Europe from 1996 onward. Every player that has played in at least one such tournament has their own page, where you can find a record of their rating development, and the tournaments and games they played. Players can personalize the page with a picture of themselves, which hundreds of players have already done. Tanuki no hara tsuzumi is Japanese for The raccoon-dog drums its belly. It is the colorful name of a tesuji used in capturing races. The diagram to the left shows an example. 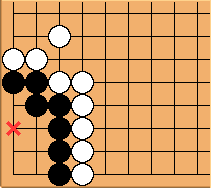 In this position, because of the lack of liberties of the white stones, white cannot allow black to create additional liberties near the edge. The moves and are the tesuji used to achieve this, and are the moves known as tanuki no hara tsuzumi. Knowing this tesuji can be vital during your games, and is the proper punishment against at least one trick play in a common corner position. The walkie talkie seven is the shape shown in the diagram, the point is the vital point. If Black defends there he will get 6 points of Black territory. 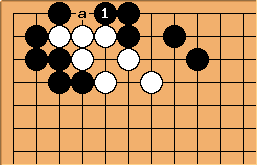 If White plays first, several interesting continuations exist, including thousand year ko and seki, depending on the number of outside liberties. In this article, all the variations are exhaustively explored. The double crosscut to connect is a tesuji for connecting. It makes use of the fact that the opponent will run into a shortage of liberties with some of his stones by ignoring an atari that would otherwise save them. Both Europe and the United States have a large yearly go congress, the European Go Congress and the US Go Congress. After the discovery of new copies of the Igo Hatsuyoron in the 1980's, it is widely believed that this is the most difficult problem ever. Composed by Dosetsu himself, it is in the words of Fujisawa Shuko, who solved it with the assistance of some of his students), "a lifetime masterpiece, with elegant shapes, a striking novelty of the theme, a precise balance of the fights, etc." The Fujitsu Cup is the oldest of several tournaments that are considered world championships. Is has been held every year since 1988. Initially, it was a 16 player knock-out, then grew to 24 player with 8 seeded into the second round. The most recent edition, held just last week, featured 32 players and was won by Park Junghwan, who defeated Qiu Jun in the final. Iyama Yuta came third by defeating Jiang Weijie. Baka No Itte (馬鹿の一手), literally The Hand of the Imbecile, is the antithesis of Kami No Itte (神の一手), The Hand of God. It is part of the natural balance of cosmic forces. Whereas those who seek to improve at Go are striving for Kami No Itte, they are simultaneously seeking to distance themselves from Baka No Itte. Conversely, those who strive for Baka No Itte ... well, ... you get the picture. Read on to see the hilarious cartoon by Chiyodad, illustrating this concept. McMahon Pairing is a method of pairing players in a tournament. Developed by Lee McMahon and Bob Ryder in the 1960's as a club ladder system, its advantage over Swiss Pairing is that it avoids the problem of severely unbalanced pairings in early rounds. McMahon pairing generalizes Swiss Pairing by assigning different initial scores to various players. McMahon pairing has become the default choice for amateur Go tournaments in Europe and America. Read more on how to run a tournament using the McMahon system. is the nose tesuji, also known as nose attachment. It is often overlooked by beginning players, who will generally prefer a or b. The nose tesuji is the logical third option, also taking away a liberty from the white stones. 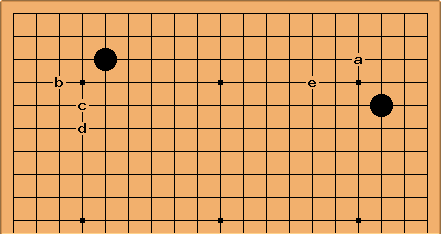 Although playing a knight's move that the opponent can separate is normally bad, in this case the black move is a knight's move away from two stones at the same time, thus making miai of a and b. 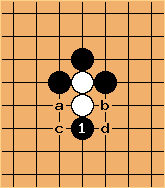 White may try to hane at c or d, but often the Black atari at a or b will be an effective response. Seo Pong-su, born 1 February 1953, is a Korean 9-dan professional Go player. He started playing at age 14, achieved professional status in 1970, and was the fourth Korean 9 dan in 1986. Throughout the 1980's he was Cho Hun-hyeon's main rival in the top Korean tournaments. In the early 1990's he was recognised as one of the "gang of four" who dominated the Korean go scene. The sequence shown can be played in many situation. It can be played in an otherwise empty corner, but also with a pincer stone in place at any of the marked points. After , several joseki are played, starting with any of the moves a, b or c. Which is more popular depends on the overall situation. Here, several variations are analyzed with an eye on the importance of context. Keep your own stones connected. Use your own stones efficiently. These are but some of the many basic strategies listed. Some of these are so basic, that you may have heard them in the very days you started playing. Still, it isn't always easy to keep them in mind and to play accordingly. Try to keep the items on this list in mind at all times! This is a simple abstract concept that applies to database search, and gives one answer to the question: what do 'they' play? It is particularly interesting for whole-board (fuseki) patterns, which tend to fluctuate according to fashion. Much of the statistical analysis in Sensei's Library is widest path analysis plain and simple. cuts by striking across the keima, away from the supporting black stones. This is generally preferable to cutting at a. Promoted to 9-dan in July 2004 for his victory in the international Fujitsu Cup tournament. At this moment he was 19 years old, and the youngest "Korean" 9p. Shuho (秀甫 Shūho), born as Murase Yakichi (1838 - 1886) was a Japanese professional. He is also known as Murase Shuho (村瀬 秀甫 Murase Shūho) or Honinbo Shuho (本因坊秀甫 Hon'inbō Shuho) and was the 18th hereditary head of the Honinbo school, as well as an unofficial Meijin by acclamation. He wrote Hoen Shinpo, 1882, Shuho's Opening Theory. Shuho was passed over for being the head of the Honinbo House in favor of Shuetsu, who was Shuwa's son, despite being substantially stronger. In 1879, he founded the Hoensha (The Square and Circle Society), an important go organization of the late 1800s, which published the magazine Igo Shinpo. While leading the Hoensha, Shuho wrote his magnum opus Hoen Shinpo, a major work of opening theory as well as game commentaries. Oiotoshi describes a situation where a stone or group of stones is put into atari in such a way that there is no escape. This occurs usually when the only way to save such a group is to connect, and that the resulting group is still in atari. Hence the related English terminology, connect-and-die. Antti Törmänen, known to KGS players as tien, is currently studying in Japan as an insei with the Nihon Ki-in. He maintains two weblogs, where he shares his experiences on and off the board. One is in Finnish, but the other one "Go of Ten" reaches out to a wider audience in English. Among basic techniques the loose ladder might be the one, which is missed most often in amateur games. In a loose ladder the stones to be captured have at most three liberties, and are constantly reduces back to two liberties.